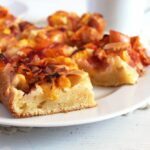 A super easy nectarine or peach cake recipe, moist and delicious, a real summer treat. One very easy cake recipe, which can be made either with nectarines or peaches, whatever you happen to have. 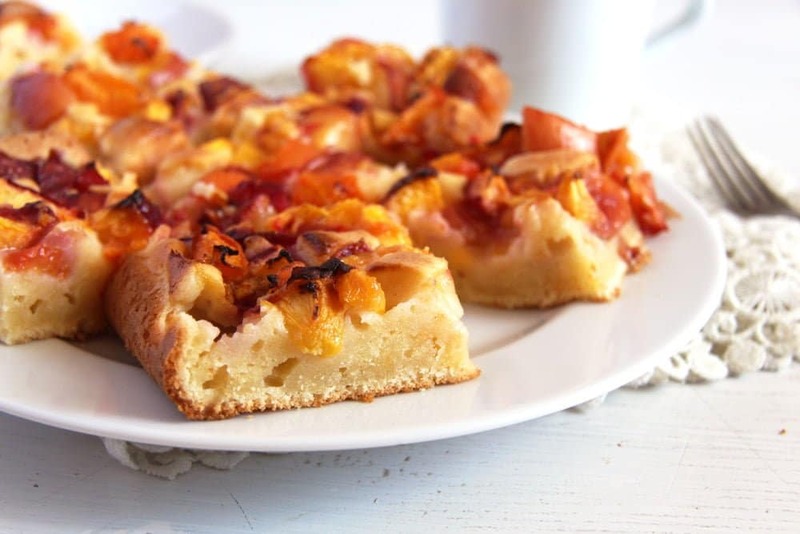 And not only nectarines or peaches are suitable for this cake, it will definitely be just as delicious with apricots, fresh cherries or sour cherries, gooseberries or even apples. The kind of cake recipe to have on hand for any summer gathering or celebration, it is made in no time, the ingredients are cheap and you probably always have them in the house and you can use whatever fruit you like or happens to be in season. And I have yet to meet one person who didn’t like this cake, well except somebody going completely sugar-free or something like that. Otherwise I hope the summer is treating you well. We finally have some nice days again here in Germany, the first week of July was a disaster, but now things are getting better. Well, by the time this post is live on Where Is My Spoon, it will not be the beginning of July anymore. I am writing this in advance, as we are spending the last 3 weeks of the month in the North of France. Right now at the time of writing I am a bit out of my mind, if I can put it this way. My son has his best friend over and for some reason and despite the nice weather, they only want to play in the living room. So the living room is so full of Lego pieces you cannot pass through anymore and did you ever notice that children, when they are more than two (and they are three now with my daughter) are just not able to talk in a normal tone? It doesn’t matter if they are fighting or not, they are just so loud and shouting at each other continuously. So I will keep it short today. 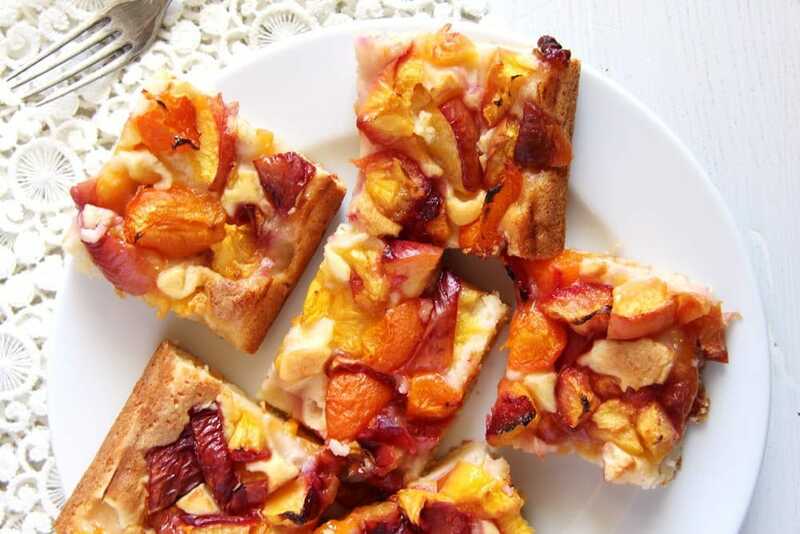 Enjoy the summer and this delicious Nectarine Cake. Preheat the oven to 180 degrees Celsius/ 360 degrees Fahrenheit. Line a baking dish of approximately 21x32 cm/ 8x13 inch with baking paper. Prepare the fruit. Stone the nectarines or peaches and cut them into larger cubes or slices. Place in a colander and let drain slightly until you make the batter. Separate the eggs. Beat the egg whites until stiff and glossy. In a mixing bowl beat together 150 g/ 5.3 oz/ ¾ cup of the sugar, vanilla extract, smetana/sour cream and soft butter until creamy. In another bowl mix together the flour and the baking powder. Incorporate into the butter-egg mixture. Carefully fold in the stiff egg whites. Pour the mixture into the prepared pan. Arrange the fruit on top and sprinkle the fruit with the remaining 50 g/ 1.7 oz/ ¼ cup sugar. Bake for 30 to 40 minutes or until the cake is baked through. The cake can be served either lukewarm or cold. 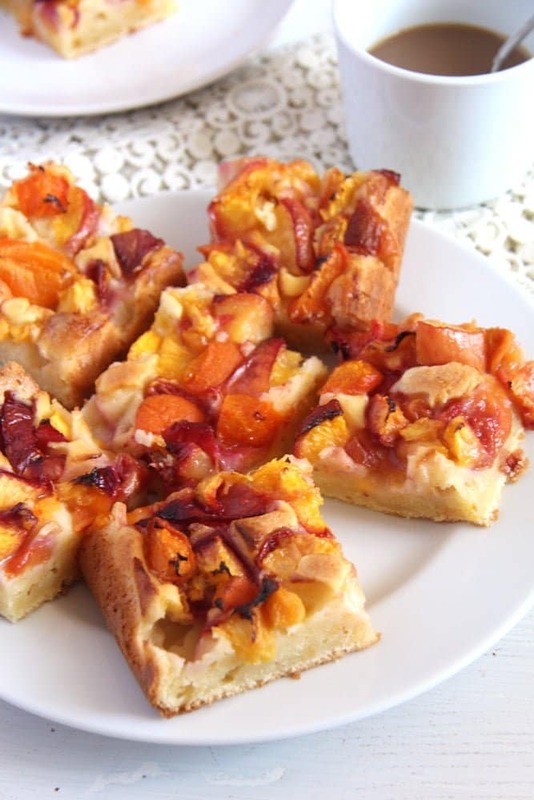 A wonderful summer cake…perfect for the stone fruit season, Adina. What great timing! Monday I bought a piece of sour cream apricot cake and it reminded me as to how very good these cakes are. 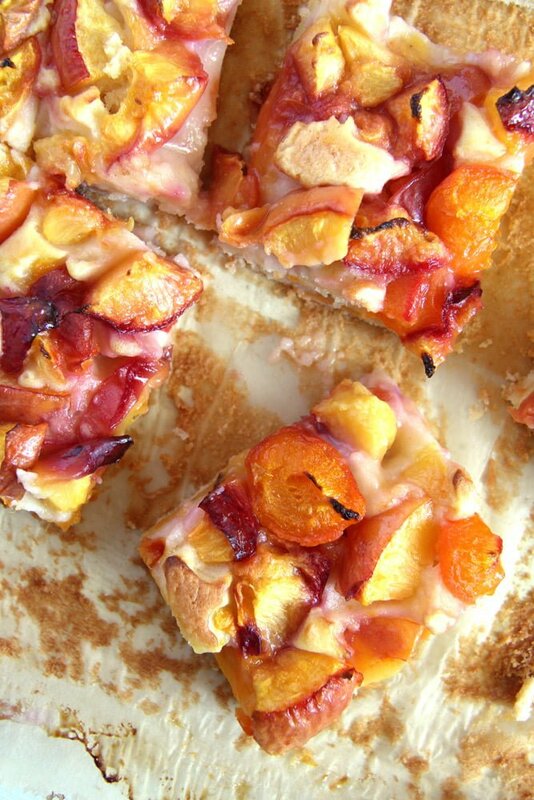 Since peaches is my favorite summer fruit (right next to watermelon), I know that I need to make this. This looks so good and I love how easy it is to make. My kind of baking. 🙂 Thanks! A simple moist cake makes such a great bed for seasonal fruit. This looks perfect for summer! Sounds delicious. x I hope you have a wonderful time in your holiday. 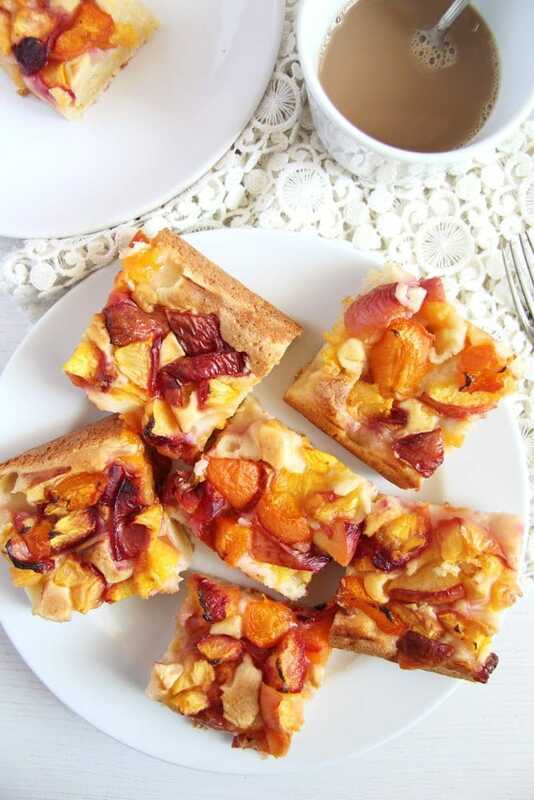 You know, I’ve never baked with nectarines but this sounds like an excellent idea! You mentioned peaches and I realised this cake looks much like my mum’s easy peach cake I really love. what a pretty cake! i like that a good portion of it is fruit, and it looks to be a unique texture too. nice! Sorry about that, Jill. I added the flour amount, I can’t believe I left it out. Thanks for pointing it out.